The two National League playoff series finally kicked off yesterday, and while the Giants-Nationals opener was a solid appetizer, we'll really only be remembering the satisfying main course between St. Louis and Los Angeles, a 10-9 win for the Cardinals. Cards-Dodgers had a little bit of everything. A playoff hero and Cy Young winner, Adam Wainwright and Clayton Kershaw, facing off on the mound, the L.A.-St. Louis culture clash and most importantly, a bevy of stars on the field. 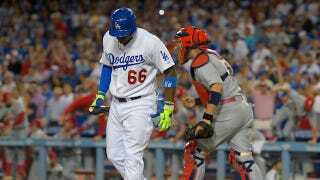 The excitement of the game picked up in the bottom of the third, when Wainwright plunked Dodgers' phenom Yasiel Puig to start the inning, sparking a small shoving match as both benches cleared. L.A. would score two runs in the third, and do the same in the next two innings, chasing Wainwright after 4 2/3 innings, tagging him with six runs. Kershaw's performance was even more baffling. The Cy Young-lock and NL MVP favorite was cruising through six innings, allowing only two runs and using the shadows around home plate as another advantage in confusing hitters. But he fell apart in the seventh, giving up five runs in an inning in which the Cardinals scored eight to go up 10-6. Kershaw became the first pitcher in postseason history to give up seven runs in consecutive starts. L.A. would have one last chance. The Dodgers made it a 10-9 game in the ninth, and with two outs and a runner on third, Puig came up with a chance to tie or win the game. But he couldn't catch up to Cardinals closer Trevor Rosenthal, who uncorked a 100 mph fastball by Puig to end the comeback. Kershaw fell to 1-4 lifetime in the playoffs with the loss. Matt Carpenter was the hero for St. Louis, hitting a home run in the sixth and three-run double in the decisive seventh, both off Kershaw, to carry the Cardinals. Lance Lynn will take the mound for St. Louis against Zach Grienke in Los Angeles for Game Two, which is tonight.